Super Saurus Get a Star! 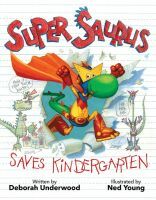 Deborah Underwood's SUPER SAURUS SAVES KINDERGARTEN received a starred review from Kirkus! "Imagination as a coping mechanism equals lots of superpowered fun." New Picture Book Deal for Diane Mullen! Diane Mullen's ONE LITTLE LOT, a joyous celebration of life in an inner city neighborhood by way of developing a neighborhood garden, again to Julie Bliven at Charlesbridge, by Ammi-Joan Paquette at Erin Murphy Literary Agency (World). It's a lovely, warm, and celebratory text that is going to make an amazing picture book once it's paired up with the perfect illustrator. I couldn't be happier for Diane—and for us who will soon get to enjoy this book. Congratulations!! Join Hyacinth on her adventure! Jacob Sager Weinstein's HYACINTH AND THE SECRETS BENEATH is available today! Congratulations, Jacob - we're so thrilled readers can now join Hyacinth on her adventure! Some books spring fully-formed from the author's brain into the laps of an eager editor. Others are a labor of love on both sides; and, perhaps, are even the sweeter for that process. This book is a case of the latter—a book which has through a variety of shaping and incarnations over the past several years, until it has become a story that is even sweeter, spicier, and more poignant than you might expect from the ever-talented Curtis Manley. And it's coming once again under the watchful auspices of Emily Feinberg at Roaring Book. Yep, folks: ROBOT DOG is a treat—the story of about a girl who has wanted a dog forever, and finally decides to take matters into her own very capable hands. A friendship story with just a dash of programming instruction thrown in for good measure. What could be better? Well, the only thing that could possibly have made it better would be illustrations by LeUyen Pham. And that's what we got! The whole package will be a while longer in the making—not splashing onto a shelf near you until spring 2020—but so very worth waiting for. And so I am very happy to say that a character I absolutely adore, 12-year-old homeschooled, adopted son-of-a-preacher Ham Hudson, who is himself a bit tender for the meat grinder of public school, is in Mary's hands in GREEN EYES AND HAM. I know he will make some mistakes—some huge mistakes, even—but he'll be treated well and emerge in the end a better human being whom I love even more. Mary is busy putting words to page so you can meet Ham soon, as her ELEVEN AND HOLDING editor, Kristen Pettit at Harper, plans to publish GREEN EYES AND HAM in winter 2019! Megan Wagner Lloyd's BUILDING BOOKS, illustrated by Brianne Farley, about a pair of siblings who argue over which pastime is best: reading or building? to Julia Maguire at Knopf Children's, for publication in Fall 2018, by Ammi-Joan Paquette at Erin Murphy Literary Agency for the author, and Paul Rodeen at Rodeen Literary Management for the illustrator (World). This is quite honestly one of my favorite texts of Megan's—and, for those of you who have read her books, you will know what a statement that is. I cannot wait for the rest of the world to get to enjoy it as well. 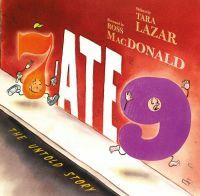 We're celebrating the release of Tara Lazar's fun and hilarious 7 ATE 9 today! Huge congratulations, Tara! Another Picture Book Text From Nancy Raines Day! I'm so delighted to announce another picture book text from Nancy Raines Day! This one has had to stay on the DL for far too long, but now we've got an illustrator attached and the news can be shouted to the world. Ahoy matey! Author of What In the World? Sets in Nature, Nancy Raines Day's picture book, Pirate Jack Gets Dressed: A Colorful Yarrrn, to Andrea Welch at Beach Lane, to be illustrated by Allison Black. Day was represented by Tricia Lawrence at Erin Murphy Literary Agency, and Black was represented by Kelly Sonnack at Andrea Brown Literary Agency for publication in Spring 2019 (World). Congratulations, Nancy! We can't wait for PIRATE JACK! Susan Vaught’s First Picture Book! Susan Vaught covers a lot of territory as a writer. First she successfully wrote YA novels for years—including a doorstopper fantasy in two parts co-authored with her son, JB Redmond. Then she branched (under a pseudonym) into adult romance. Then she decided to try middle-grade, to much success. And now, we are very happy to announce her first picture book is underway! TOGETHER WE GROW is a lyrical text about overcoming hard times by joining in community. Susan's middle-grade home, Paula Wiseman Books at S&S, and editor Sylvie Frank brought it on board, matching it with illustrator Kelly Murphy. If I'm counting right, this will be the tenth time her illustrations will grace a book written by an EMLA author! Jill Esbaum and HOW TO GROW A DINOSAUR! Another Jill Esbaum title! You'll have to wait until 2018 for this one, folks, but get ready, it's FABULOUS. I'm beyond delighted to announce another EMLA-repped title for Jill (she's prolific and writes the BEST manuscripts! ), because we've got another one! Author of I Am Cow, Hear Me Moo!, Jill Esbaum's picture book, How to Grow a Dinosaur, a hilarious, sweet, surprisingly practical picture book "guide" to becoming a big brother or sister, about a young dinosaur who can't wait to teach the new baby everything he knows and who discovers the challenges and rewards of raising a freshly hatched sibling, with Mike Boldt (I Don't Want to Be a Frog) set to illustrate, to Jessica Garrison at Dial, by Tricia Lawrence at Erin Murphy Literary Agency for Esbaum, and Jennifer Rofé at Andrea Brown Literary Agency for Boldt, for publication in 2018 (World). Melanie Crowder Invites You to the LIGHTHOUSE BETWEEN THE WORLDS! It certainly has been a busy week for Melanie Crowder: Her latest MG novel, THREE PENNIES, has just released from Atheneum (recipient of two starred reviews); and her forthcoming AN UNINTERRUPTED VIEW OF THE SKY, which is forthcoming from Philomel, just received its third starred review. It only seems right to add to the lovefest with the very exciting news that there are more Melanie Crowder books on the horizon! Reka Simonsen at Atheneum has acquired A NEARER MOON and AUDACITY author Melanie Crowder's new middle-grade fantasy adventure series, LIGHTHOUSE BETWEEN THE WORLDS. The first installment tells the story of twin siblings who stumble upon a secret society tasked with protecting humanity from nightmares seeping into our world. Ammi-Joan Paquette at Erin Murphy Literary Agency did the two-book deal for North American rights. Book 1 is set for publication in Fall 2018. Another light to add to the constellation—mark your calendars and catch up on your reading stacks, because this is one you won't want to miss. Elly Swartz Takes Us All on Another Adventure! Between FINDING PERFECT (FSG, 2016) and SMART COOKIE (Scholastic, 2018), MG writer Elly Swartz has done it again. Author of Finding Perfect, Elly Swartz's middle grade, Give and Take, a coming of age story in which eleven-year-old Maggie learns that people are more than the things that hold their memories, thanks to her all-girls trap shooting team, her turtle, Rufus, and a foster baby named Izzie, to Joy Peskin at FSG, by Tricia Lawrence at Erin Murphy Literary Agency, for publication in Winter 2019 (World). Get ready, everyone. Another Elly Swartz book will be out in the world in 2019 as well! Seven EMLA Authors with New Releases! We have so many EMLA authors celebrating book birthdays this week! We're welcoming LOVE AND VANDALISM by Laurie Boyle Crompton​, THREE PENNIES by Melanie Crowder, GNOME-A-GEDDON by K.A. Holt, THE ABSOLUTENESS OF NOTHING by CG Watson, ICE CREAM SUMMER by Megan Atwood, DRAGON'S RULE, PRINCESSES DROOL by Courtney Pippin-Mathur, and JUST A NORMAL TUESDAY by Kim Turrisi, into the world!